John "Bud" and Rebecca Colligan, longtime supporters of the Genomics Institute, have established the Colligan Presidential Chair in Pediatric Genomics with matching funds from the University of California Office of the President. 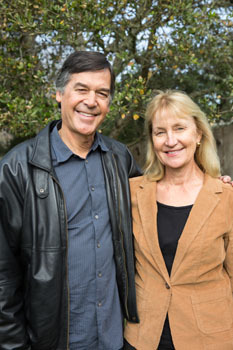 John "Bud" and Rebecca Colligan, longtime supporters of the Genomics Institute, have established the Colligan Presidential Chair in Pediatric Genomics with matching funds from the University of California Office of the President. Photo by Carolyn Lagattuta. Efforts at the UC Santa Cruz Genomics Institute to drive targeted treatment of diseases by unlocking the world's genomic information include a focus on pediatric cancer driven by the Treehouse Childhood Cancer Initiative. The Treehouse Childhood Cancer Initiative was established to analyze genomic data of children with cancer in the context of large datasets of both pediatric and adult cancers. This allows researchers to identify situations where an available drug is predicted to work for a given patient's tumor. Treehouse promotes the sharing of pediatric cancer genomic data as well as the translation of the findings from this analysis to the clinical setting. Cofounded by Olena Morozova, a research scientist at the Genomics Institute, the initiative has grown rapidly and recently received a major grant from St. Baldrick's Foundation. "Our pediatric cancer genomics program has been one of the fastest growing and most exciting programs in the Genomics Institute," Haussler said. "The focus on children's diseases is one that resonates with people here, and we've found that it's an area where our emphasis on data sharing can really make a difference." "Rebecca and I wanted to support the growth and world-class research of the Genomics Institute, and we felt particularly strongly about helping children who are suffering from rare diseases," said Bud Colligan. "The Genomics Institute has been coming up with approaches to treating pediatric cancer that have never been tried before." "It's especially exciting that this pediatric research is happening right in our own backyard at UC Santa Cruz, and we wanted to support that effort," added Rebecca Colligan.